Scientifically dubious information may sometimes appear in Google's "featured snippets." An online search -- in Google of course -- turns up all sorts of scammy sites offering advice on how to optimize web content so that it appears in these featured snippets. 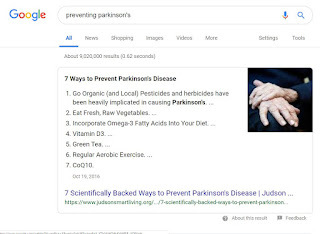 When we Google "preventing Parkinson's", we get advice to consume the co-enzyme CoQ10, but research in the journal Neurological Science found no benefit. Eat a variety of fruits, vegetables and whole grains. Fruits, vegetables and whole grains contain vitamins, minerals, fiber and antioxidants, which may play a role in cancer prevention. Choose a variety of fruits and vegetables so that you get an array of vitamins and nutrients. Drink alcohol in moderation, if at all. If you choose to drink alcohol, limit the amount of alcohol you drink to no more than one drink a day for women and two for men. Stop smoking. Talk to your doctor about ways to quit that may work for you. Exercise most days of the week. Try to get at least 30 minutes of exercise on most days. If you've been inactive, start slowly and build up gradually to 30 minutes. Also, talk to your doctor before starting any exercise program. Maintain a healthy weight. If you are at a healthy weight, work to maintain your weight by combining a healthy diet with daily exercise. If you need to lose weight, ask your doctor about healthy ways to achieve your goal. Aim to lose weight slowly by increasing the amount of exercise you get and reducing the number of calories you eat. That is mostly good advice, with one big omission. 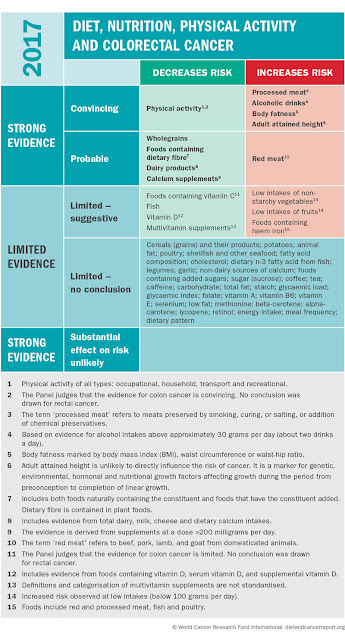 Authoritative research summaries from the World Cancer Research Fund (WCRF) and American Cancer Society (ACS) recommend lowering risk of colorectal cancer by eating less processed meats (such as bacon and sausage). These authoritative sources appear further down the list of Google results for "preventing colon cancer," overshadowed by the incomplete information in the featured snippet. From Routledge/Earthscan: Essential background reading for people inside and outside the agri-food system who want to understand U.S. food policy and economics better.